Razer has invented a new ultra-low-profile mechanical switch, which it has put to use in a keyboard case for Apple's iPad Pro. The idea here is that the low-profile switch allows for a nicely slim and portable keyboard, without sacrificing anything in terms of the typing experience. Razer says that the new mechanical switch has optimized actuation and reset points, with key presses registered from 70g of force being applied. In other words, the keys are designed to have the same feel as a full-size mechanical keyboard. Durability is another plus point for this particular mechanical switch, with Razer claiming an industry-best longevity of 80 million keystrokes. Min-Liang Tan, Razer co-founder and chief executive, enthused: "We're excited about the potential of our Ultra-Low-Profile Mechanical Switch and look forward to exploring other applications in addition to the mechanical keyboard we've designed for the iPad Pro." The mention of 'other applications' hints that while this effort is a tablet accessory, there's a chance that the low-profile switch could be coming to Razer's computer keyboards in the future, leading to more slick mechanical offerings for the desktop PC. 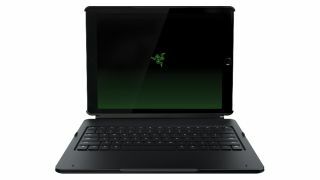 The Razer Mechanical Keyboard Case has a metal kickstand and hooks up with the iPad Pro 12.9-inch via Bluetooth, offering 600 hours on a single charge with the backlighting off, and 10 hours with the backlighting at maximum brightness. It's on sale now priced at US$170, £160 in the UK and AU$260 in Australia.